We are a leading Exporter of dry mix putty plant from Vadodara, India. 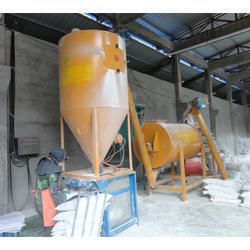 Dry Mix Putty Plant is cement based, high quality, ready mixed, polymer modified, one component putty in powder form. Dry Putty requires the addition of water on site.Dry Putty is ideal for smoothing internal and external cement base plastered walls and ceilings and fair face concrete prior to painting and coating applications. Dry Putty can also be used for patching of pre-cast concrete products. Dry Putty has excellent adhesion and long term crack resistance even at extreme weather conditions.Dry Putty provides protective base for the interior and exterior paints and helps in reducing the frequency of repainting. Dry Putty is specially formulated to provide smooth, water resistance putty when applied manually by putty knife / spatula. Also, Dry Putty can be applied by spraying machine to increase productivity. In this case Dry Putty will give rough finish surface. Related Piping, Structure, Base frame, Prime movers, etc. Looking for Dry Mix Putty Plant ?